Here some initial thoughts after reading the Horizon Report and watching the Online Event. Well for those who want some serious definitions might want to follow the link provided by Prof. Dr.-Ing. Detlef Krömker, from the Goethe-Universität Frankfurt in his presentation (only in German available). Here some not so serious definitions. The following image pretty much matches Sonja Gerber’s scenario about chocoTabs, so does that video, which is already from 2006, but describes a similar scary scenario as Sonja Gerber did. After watching it, you might not want to order pizza any longer. 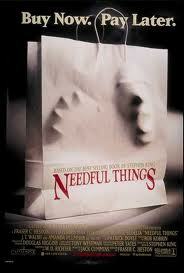 I don’t know why, but when reading about IoT, Stephen Kings book about ‘Needful things’ comes to my mind. 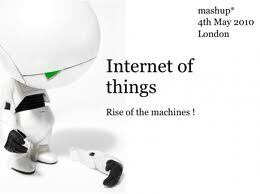 Similar to the book we might ‘desire’ the idea behind IoT, but we also might pay a far heavier price than expected. 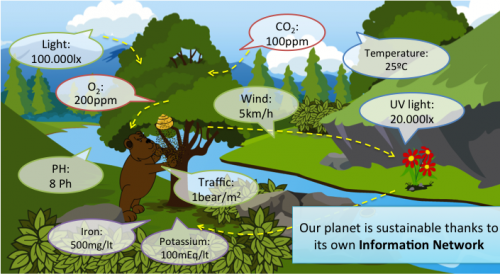 Ubidots uses nature as an analogy for the Internet of Things. 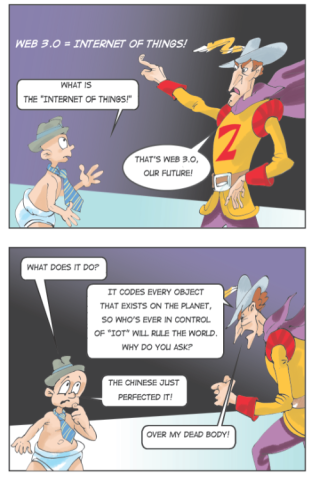 Finally two infographics that depicts the IoT in quite different ways. The first infographic from Intel lines up all the devices that we use to connect to each other (posted on Bit Rebels). It looks like a branching tree. By 2020 31 billion devices & 4 billion people will be connected to the internet. The second infographic is from Cisco (posted on Investorspot) speaks similar figures, but expects by 2020 about 50 billion ‘things’. During 2008 the number of things connected to the internet already exceeded the number of people on earth. The infographic also shows useful applications of IoT, e.g. monitoring castles or people. Quite interesting infographics. But when it comes to monitoring student and/or teacher attendance scenarios like that described from Sonja Gerber or the Marauders map from Harry Potter cross my mind and that begs for data security. Who wants to be permanently monitored, definitely not me. With large events, big brother`s maraudes map can be useful. See http://www.pressebox.de/pressemeldungen/converve-gmbh/boxid/182248 on interactive badges – or rather intelligent name tags? – facilitating social interaction with like minded people by giving a signal when someone gets near you who answered his questionnaire in a similar way as youself. This could help to swap more ideas or discuss ideas (and learn) in more detail because one looses less time looking for people. I agree, that would make a congress or big event more purposeful and would indeed greatly facilitate social interactions. Thanks for the information.